Building on the work undertaken with Brena Larcom to create SAMM roadmap charts (Part 1, Part 2 and Part 3), I have developed a similar process for single point in time scorecards. The XML is a very similar structure as used for the roadmap charts, but only one set of data are required. 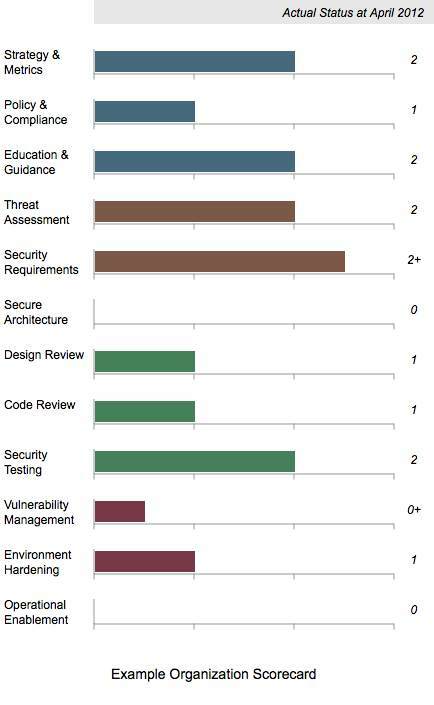 Like the roadmap files, Maturity Level information can be 0, 1, 2 and 3 or where there is additional assurances in place beyond those indicated by the Level, the “+” symbol can be used so 0+, 1+ and 2+ are also allowed. Edit and save the XML file. Then check the file is well-formed. The simplest method is to use the W3C Markup Validation Service to upload the file or directly input the file content. If your data contains confidential information, you may want to undertake this check locally instead. 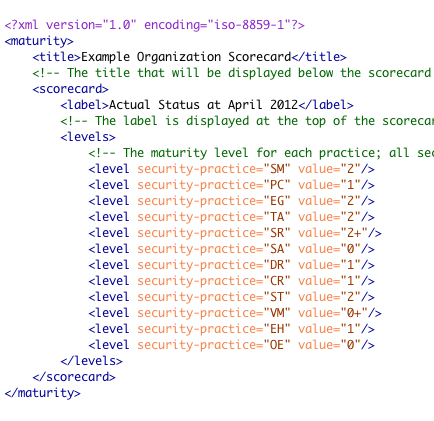 Take a tool which can undertake XSLT conversions, and apply SAMM-1.0-scorecard-0.2-en_US.xsl to your XML file. An SVG file should be created. That’s all there is to it. Again if you don’t want to use XML and XSLT, you can just edit the SVG files directly using some sort of text editor. This entry was posted on Tuesday, August 7th, 2012, 10:46 pm and is filed under Discussion. You can follow any responses to this entry through RSS 2.0. You can leave a response, or trackback from your own site.